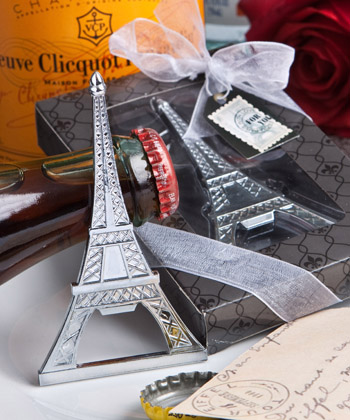 If you are looking for a Paris influence for your event, these Eiffel Tower party favors are ideal. 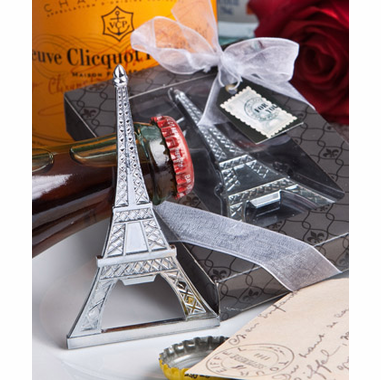 Practical and fun, these Eiffel Tower bottle openers make great French favors. Artistically designed chrome finish Eiffel Tower bottle opener measures 3.75"H x 2"W. Each comes in gift packaging displaying the bottle opener in a fleur de lis pattern gift box with white ribbon and a general use "For You" tag.